D.E.A.R. stands for “Drop Everything and Read“. This is a month-long celebration of reading designed to remind folks of all ages to make reading a priority activity in their lives. With declining literacy among children and adults, it is now more important than ever for reading to be encouraged and cherished as a worthy past time. D.E.A.R. 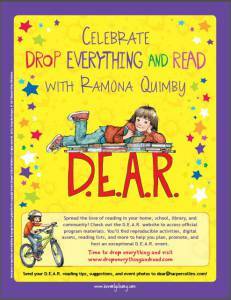 programs have been held nationwide on April 12th in honor of Beverly Cleary’s birthday, since she first wrote about D.E.A.R. in Ramona Quimby, Age 8. Inspired by letters from readers sharing their enthusiasm for the D.E.A.R. activities implemented in their schools, Mrs. Cleary decided to give the same experience to Ramona and her classmates. As D.E.A.R. has grown in popularity and scope, the program has expanded to span the entire month of April . . . offering classrooms and communities additional time to celebrate! Can D.E.A.R. be celebrated anytime?